Template:Rating Once you have successfully compiled the Editor in Linux, this page will provide you with additional information on running it. The main page is Linux support. If you use Mesa drivers use at least version >= 10.4.x . Better use newer ones. The standard Mesa drivers in Ubuntu 14.04.1/2 LTS has the version 10.1.3 and will not be sufficient for UE4Editor. You can use the Oibaf ppa which updates your mesa drivers almost everyday to the newest version. Read Oibaf PPA for more information. In the following are the steps how to use Oibaf to get the newest and "Up to Date" Mesa drivers. Restart your system just in case. … yields the version numbers currently installed. These are typically updated with the rest of the system, and as of Fedora 21 in Feb 2014, are version 10.4 (note that mesa-libGLU uses its own version numbering scheme). The lower-level drivers are in mesa-dri-drivers. NB "dnf update" will do approximately the same thing as "dnf upgrade," but is more conservative about removing old packages and such. You should get the newest drivers for Nvidia based gfx cards. Don't use the 331.x drivers because they might cause problems. <package name> can be like nvidia-370. Check the list which drivers are supported. See here  for more information. Generally this happens with Mesa drivers. Edit ConsoleVariables.ini and add r.TriangleOrderOptimization=2, if there's no such parameter, else change the value to 2 if the parameter is already there. If you are experiencing screen/font corruption that looks like the image above, please update your graphics drivers. Set the Anti-Alias level to "Medium"
Switch off the Reflection Environment (r.ReflectionEnvironment=0) while using Reflection cubes or spheres (Sometimes necessary). If you're running on an computer with Nvidia Optimus (Intel and Nvidia on a laptop), run the Editor through optirun or primusrun, otherwise you will run into OpenGL context issues and the editor will not run. If your lighting is failing or stuck at 0%, make sure that your firewall is not blocking port 6666 and/or 230.0.0.1 network. It uses those for multicast operation, and is safe to open/enable in your firewall. Of if you have Ubuntu and/or Uncomplicated firewall (ufw) you can run this command. Do not try to use UE4Editor on separate "virtual" desktops. That means if you try for example to put a Blueprint, Matinee or the Cascade Editor window etc. into another virtual desktop, it will not work. 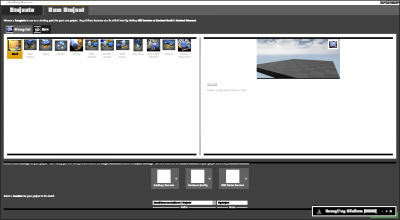 You can use UE4Editor on multiple monitors. The Unreal Editor supports Maya-style pan, orbit, and zoom viewport controls. Unfortunately it's using the ALT key on Windows which can be troublesome because that key is usually assigned to do other stuff in the world of X11/WM. To get the same behaviour like on Window change the assignment of the ALT key in you Window Manager. Go to Settings menu, select Window Manager Tweaks and select the Accessibility tab. Change the field: Key used to grab and move windows. Select one which does not use the ALT key. Install Compiz Config Settings Manager (sudo apt-get install compizconfig-settings-manager in a terminal) and open it. Select "Window Management" and then the "Window Movement". Click on the button which is on the right side of the "Initiate Window Move" label. Select the "Enable" checkbox to disable or change it so that it does not conflict with other key combinations in UE4. Maybe "SHIFT" could be used. Gnome 3 defaults to using the Super (Windows) key instead of Alt, which should work fine. If you need to change it, install Gnome Tweak Tool (sudo apt-get install gnome-tweak-tool) and open it. Select "Windows" on the left side, then change the "Window Action Key" setting. If you prefer working without an IDE, and the built-in compiler tool is not feeding back useful compiler errors, it's possible to invoke C++ script compilation from the terminal, and make using the toolset easier. Inspired by this forum post, below is a set of .bashrc functions which can be used to build, generate and launch C++ projects. DIR="$( cd "$( dirname "$i" )" && pwd )"
To use a specific IDE SourceCodeAccessor see the list below. If you are using Unreal Engine 4.9 >= you don't have to clone the accessor because CodeLite is fully integrated. Additionally, you may wish to watch this video (NOTE fairly outdated) UE4Editor/UProject inside Qt Creator debugger, which shows you how to create a kit in Qt Creator capable of compiling your project for in-IDE debugging and editor debugging. For KDevelop there is a plugin that comes with the engine source code that is automatically built with UE4Editor. https://github.com/bdidemus/EclipseSourceCodeAccess - Fork updated for new versions.